Happy Christmas to me ! PS. On my shopping journey to the underwater world of miniatures, I discovered this Aqualops (pic on right) ! It is definitely finding it's way into the army somewhere ! 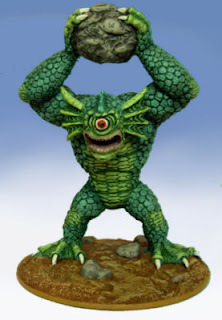 I have been struggling to find some suitable miniatures for the Tide Watchers so I might drop them and make a new suitably weak but tactically interesting core unit out of the Aqualops and these other freakish weed like creatures from hydraminiatures.com (see below). At the moment I'm thinking of a very short range "artillery" (in the weakest sense of the word) unit. The weeds can pull up the rocks and the Aqualops can throw them ! It's probably going to happen because I'm the only one collecting the army and I've just ordered some of the miniatures. There's no room in special or rare units, I like the composition of those sections at the moment and, in any case, we don't need another powerful unit. So I'm going to pop them in core, make them very limited in power and restrict their use in some way. Or at least that's my current thinking. I might drop the artillery thing and make them close combat with a stand and shoot reaction with the rock, I'm not sure yet. Let me know if you have any ideas. 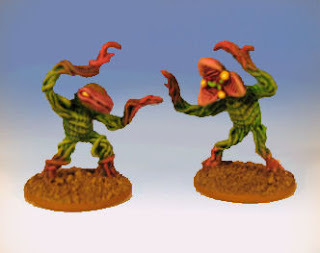 Here are the surrounding weedlings I'm thinking of including with the Aqualops (I might have to change the name in case it's copyrighted - I'll ask hydraminiatures for permission).